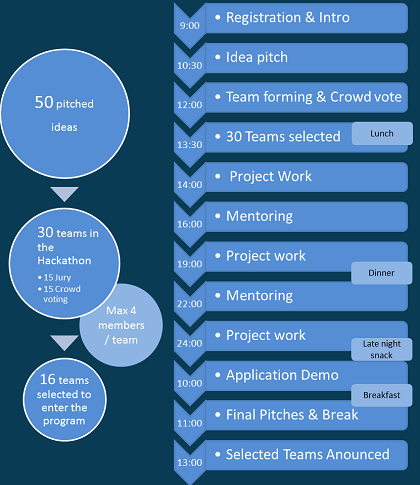 The 24 Hours Hackathon (1st March – 2nd March) will provide context for sparking new ideas, consolidating teams and incorporating valuable feedback in the proposed ventures. The event is aimed at students and young enthusiasts that will form teams up to 4 members. 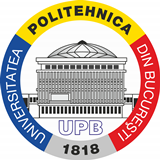 The location for this event is Politehnica University of Bucharest - the Central library building. 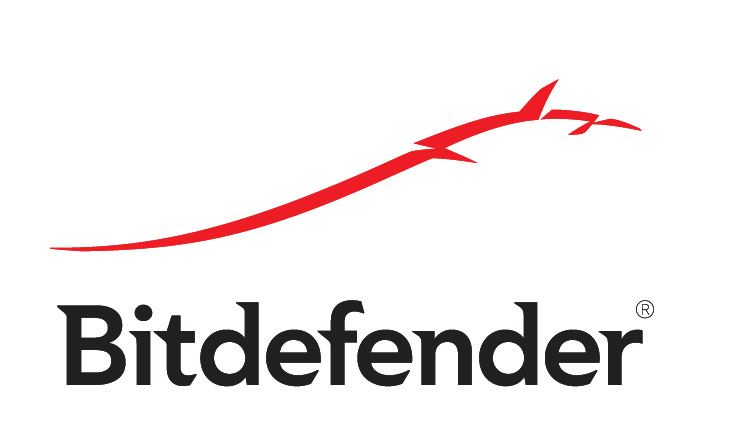 In order to participate in the Hackathon, please use the registration page by 26th of February. You will be notified of your acceptance by the the 28th of February. Starting with 9:00, all participants that were accepted to the Hackathon are expected at the registration desk. Building Location: New Library Building, Politehnica University of Bucharest. Registration desk location – 2nd floor - Floor Map. Each participant / team representative (one person per team), will have 1 minute to pitch his/hers idea to the public and the jury. Up to 2 question will be asked by the jury members. 50 ideas will be accepted after the on-line registration, and pitched on-site in the idea Pitch stage. 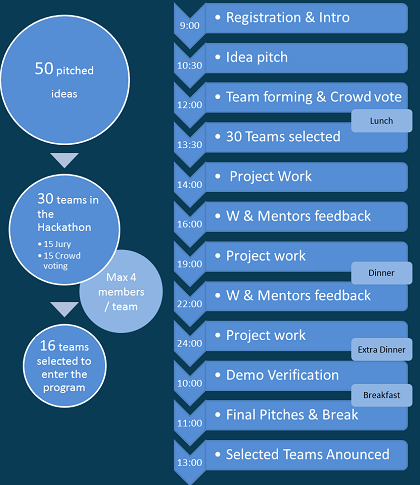 Out of these 30 ideas will be selected to participate in the 24 hours Hackathon. - It is selected as a result of a Crowd voting system: After the public pitches, each participant who proposed an idea will receive a flip-chart on which to to sum up his proposal and get votes form other participants. The participants vote with little stickers that they will receive in their goodies bag at registration (each participant will receive 3 stickers). If you have an idea but no team, or your team wants to complete its ranks with somebody with certain skills, this is the phase that you should use in order to make other participants believe in your idea and persuade others to join your team should your idea be selected for the next phase. In the next 24 hours, up to 30 teams will enter the work phase – they will have to bring their ideas to a point where they can present at least a proof of concept, as well as having a good understanding about their potential costumers and growth expectations. During the Hackathon, their will also be 2 Feedback sessions – mentors (tech entrepreneurs, industry leaders, experienced team leaders and product managers, tech angels) will spend up to 15 minutes with each team in order to provide feedback and counseling. Before entering the final presentations and jury deliberation phase, each team will be asked to provide a short demo of their progress in order to prove their technical concept, as well as convince jury members that they have the technical soundness and determination to execute the proposed project. In the final pitch, each team will have 3 minutes + 2 minutes for Q&A in order to persuade the jury that their idea and implementation should enter the next phase of the Innovation Labs project.